Vendor We did it! The X Citing Adventure at OCDetail! Discussion in 'California' started by Joseph Torbati, Feb 4, 2016. 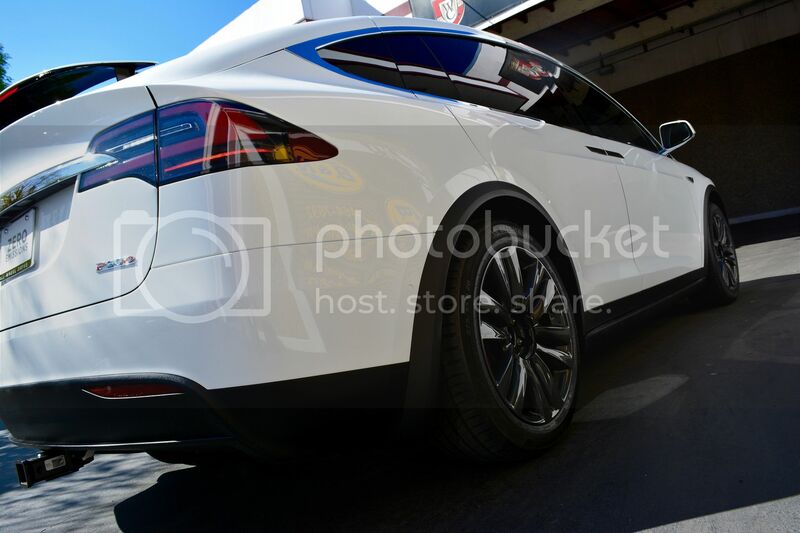 At OCDetail we have worked on hundreds of Tesla's. Making sure we always strive to meet and exceed expectation with any service preformed. That commitment to service and excellence brought us an amazing opportunity. 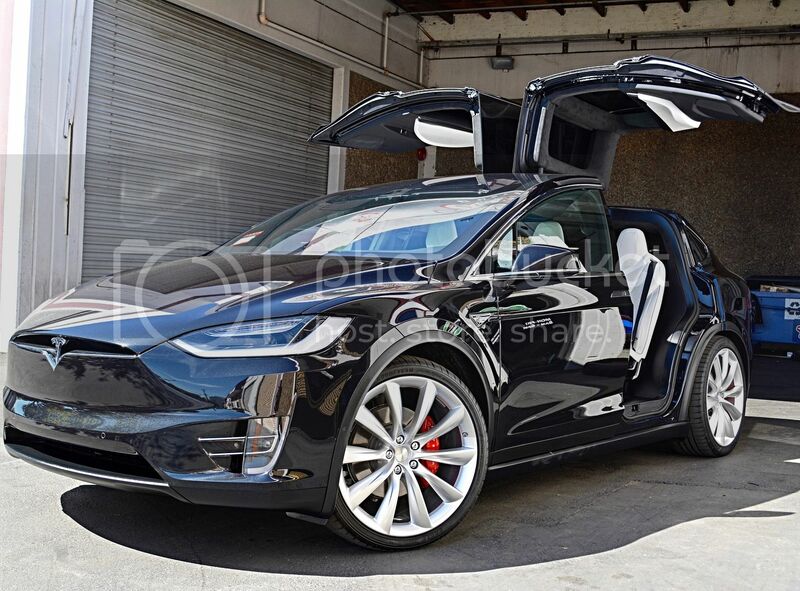 A customer with a very low number Signature Model X P90D enlisted me to go take delivery for him so I could protect his X right out of the gate. Painfully I agreed. Tragic when you have to drive someones brand new X before they ever see it. Made it back the shop in one piece and with out incident. Drives amazing! Sanding scratches! This happens when during the painting process when dust gets stuck in the clear coat. Looks like this! Clear reflection and no marks! We alway check our work. I remember seeing this when I was correcting the paint but got a phone call. So during film I noticed it and took care of it. The importance of checking your work! We are as OCD as they come but we are still human. And anyone who has met me noticed I'm pretty high energy guy. So SQUIRREL! The impact area's we decided to cover with film is the full front end, lights, mirrors, door pillars, the black pieces between the falcon doors and front rear glass, the lower rocker(above pic), the A pillars, and the complete rear bumper. I figured this would cover all my basis for typical use. After all our correction and film was done the wheels were pulled to get powder coated Turbine gray. 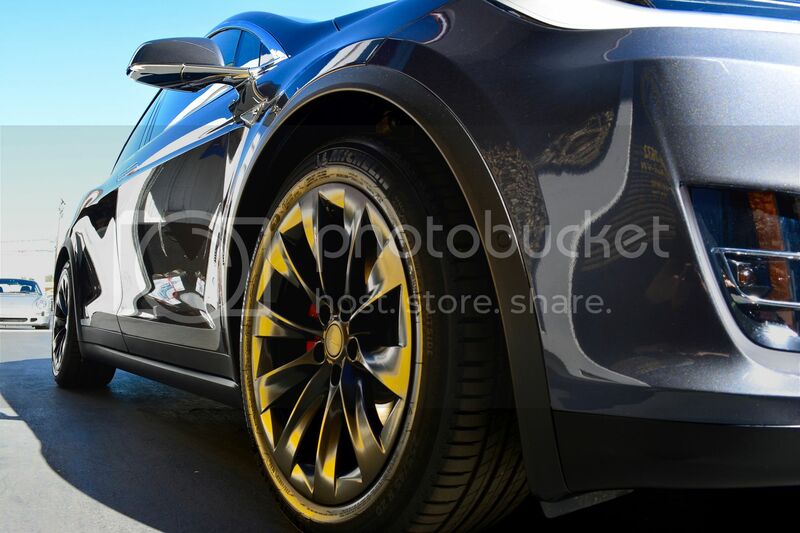 We also detailed the brake calipers and coated them with 4 coats of Cquartz Dlux. Back from powder coatings coated with Cquartz Finest! Ok now to the fun part. After all our prep was done, and film, and window tint, and wheels. We coated the entire vehicle with 4 layers of Cquartz Finest nano coating. Cquartz Finest is the most exclusive coating in the world and the only coating the really scrutinizes installers before allowing them to use their product. There are tons of new coatings flooding the market and they all strengths and weaknesses but no matter how good it is.... If the installer doesn't prep the car right, if the installer does not apply it right, you will end up with sub par results. Finest installers always deliver and is the reason its the benchmark when mark comparing coatings. Drum roll!!!! Thats what a new X should look like! Can you see the Xpel? Forgot mention we Xpel'd the spoiler as well! Dat Gloss! And will Cquartz Finest it will stay that way! 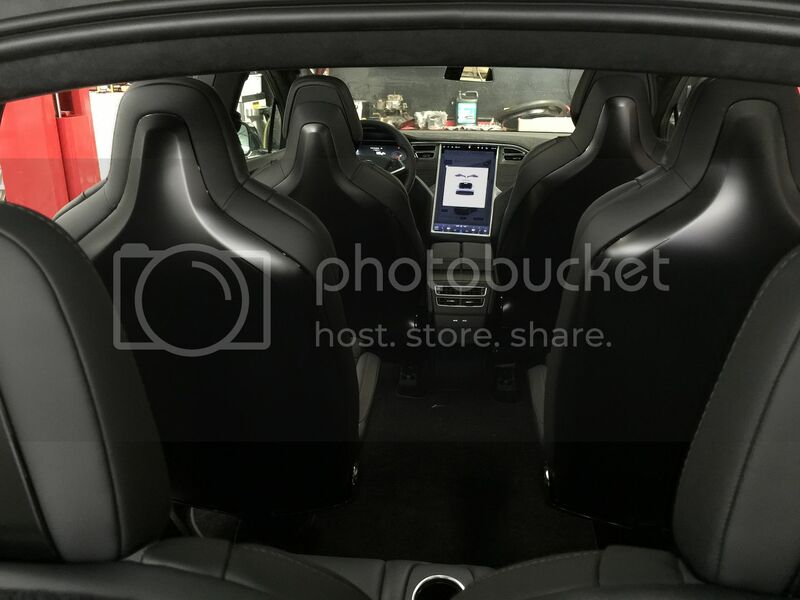 The Interior was protected with Cquartz leather and fabric for a OE Matte look and appearance. No slimy whale blubber look here! And now this light color will clean effortlessly. Notice the satin appearance on all the trim. We coated it with Cquartz as well so it will stay that way! The sun doesn't lie! Thats a flawless finish! An OCDetail approved New car! The difference is clear! Same service on this one! That makes 4 so far! Way to go Joe! Fabulous!! Excellent work. So few people take pride in their work and are passionate. Very refreshing. Holy cow! You guys made that look amazing. Pictures are worth a thousand words as they say. Amazing work Joe! Many great comments from fellow Tesla owners for the work you did on my Model S by the way! As usual, you have knocked it out of the ballpark! It looks fantastic! That is ridiculous gloss! Like a wet ruby...gorgeous! How much would that treatment set me back? And for an S? I want it! Gotta say I was a sceptic like many others, until u and other pros showed what factory quality is side by side with paint corrected results. Very impressive. I didn't do a wrap. But Joe did do a full paint correx and 2 coats of CQF. Worth every single penny. Still looks like day one after 16 months. The shine is unbelievable. He and his team are amazing! Wish we had someone like that in MD...awesome job! 1: There is nobody like Joe! He literally came to my house, arriving at 1 or 2 AM, spent the night in my guest apt, and then spent something like 16 hours straight doing my car. Then he drove to the next job at midnight when he was done. I have no idea how he does it. I will never let anybody else touch my car. 2: You have to live in CA to be this obsessed. We don't allow you into the state unless you are:smile:. Thank you for all the kind words everyone! This was a fun project and a TON of work but was very pleased with results! Come on!! You already caught me sleeping upside down from the rafters in your garage... Then there was the strange allergies to garlic but shhhhhhhhh . Thank you for the support my friend glad cars holding up so well and make sure you stop by next time in the bay! it's been asked twice in this post about the price, but no responses....Hmmmm. Wouldn't worry, Joe will probably pm you. For lurkers, just pm Joe. Prices can change, but forum posts tend to live on indefinitely. So installers tend to avoid posting specifics. Ask privately or check the websites of some detailers if you're really interested. If you're just "ballparking," think in terms of thousands, not hundreds. Thank you, and yes this correct! I learned this lesson a very hard way a few years back and it still comes up every now and then. Joe detailed my nearly new S 70D last summer, put on Xpel, and then Opticoat over everything. I then proceeded to drive the car to all states but Hawaii (where I'm from). Upon trip's completion, I brought the car to Joe, he touched up a few things, and it was looking good as new 15,000 miles later. His work is beautiful, he charges fairly, and I am one happy customer. 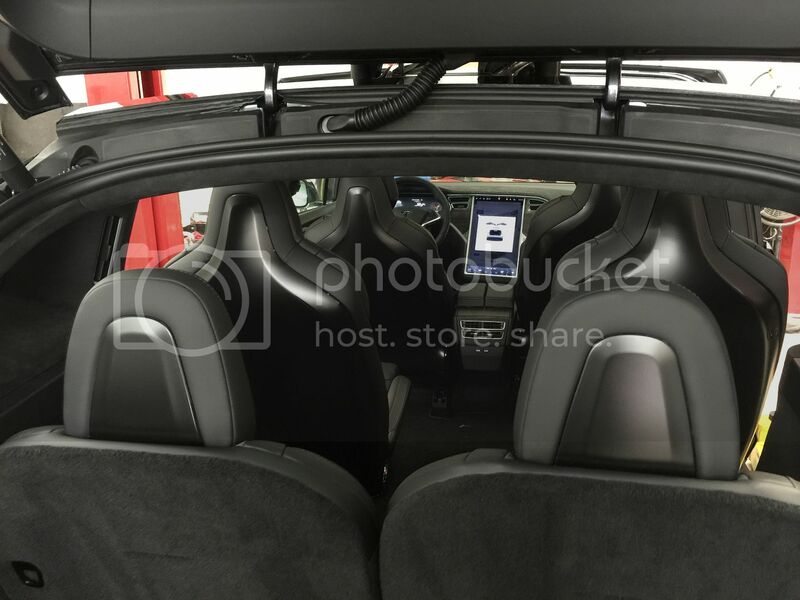 Couple shots of some of the back of seats in Xpel Stealth! Also were now on our 14th MX here are a few shots of the other ones we've worked on! Inside out Cquartz Finest, 60% Xpel wrap, Powder coated wheels, 3m Crystalline tint, and seat backs in stealth! Same service minus the tint! How you like the 20's in satin black? And Dlux on the trim will keep it that way! Black blinding after 60% Xpel Wrap, Wheels off detail, Blackvue install, and of coarse Cquartz Finest! The reflections of door was shooting at the wall behind gives you an ideal of the clarity in the paint! These are a lot of fun, really appreciate the support of the community and belief in our work!